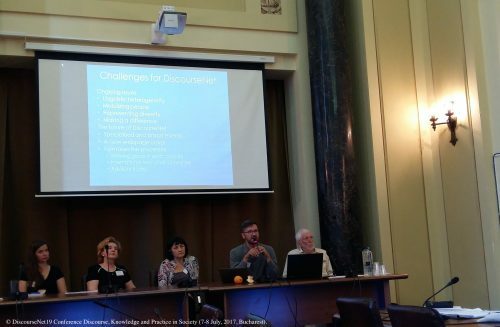 Last July, the University of Bucharest hosted the DiscourseNet19 Conference Discourse, Knowledge and Practice in Society (7-8 July 2017) where two of our researchers participantes. Prof. Laura Muresan reunited with some old colleagues in a very thought-provoking round table, moderare by the critical discurse analysis leading figure Norman Fairclough, titled “Whither CDA? Rethinking the objectives and research agenda of critical analysis of discourse in a time of political-economic change”. On the other hand, one of our junior researchers, Phd candidate Rosana Villares, presented some preliminar results of her Phd thesis. The two main pillar of her work are internationalization strategies and language policies in Higher Education, and in this occasion, with the title “Going international’ in Higher Education: A Corpus-Driven Analysis of Strategic Plans in a Spanish University” she introduced the internationalization strategy of the University of Zaragoza from a top-down approach thanks to the analysis of policy documents.